Jaguar’s AVAS technology emits a sound that mimics car engines to help the blind and the visually impaired become aware of an approaching car. One of the best things about electric cars is that they operate silently—a bit too silently even, it seems. Like many car makers before it, Jaguar has decided to equip its latest electric soft-roader with an audible alert system. Dubbed Audible Vehicle Alert System (or AVAS), the system creates a sound that can be heard outside the car at speeds below 20 kilometres per hour. This system allows the blind, the visually impaired, and other vulnerable road users to become aware of the car’s presence around them. Pedestrians have long been used to hearing the sound of internal combustion engines at a zebra crossing and on the roads. It helps them tell if a vehicle is about to pass by and if they should wait before crossing the road. With electric cars being completely silent, this necessary aural feedback is completely absent. AVAS creates an artificial but credible engine sound for pedestrians around it. The I-PACE’s soundtrack was tested by members of Guide Dogs for the Blind, a British charity. An upcoming European legislation requires all electric cars to emit at least 56 decibels of sound when running under 20 kilometres per hour. According to a recent press release by Jaguar, the I-PACE already passes all such upcoming legislations in the world. “We developed the Audible Vehicle Alert System for the I-PACE to ensure the safety of all road users. 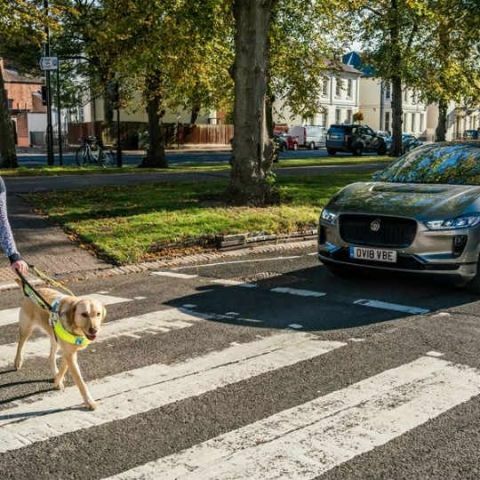 Our potentially life-saving technology cannot be switched off and as the leading charity for people with sight loss, we are pleased to have the support of Guide Dogs to ensure real people are at the heart of our product testing,” comments Iain Suffield, Technical Specialist of noise, vibration, and harshness at Jaguar. According to the press release, AVAS was developed and perfected over a period of four years by Jaguar engineers. The system was designed in such a way that the soundtrack is audible yet discreet and cannot be heard from inside the car. The alert rises in pitch and volume in relation to the speed of the car to make the alert sound more realistic. When in reverse, a secondary tone accompanies the alert to indicate the switch in direction. Jaguar unveiled the I-PACE earlier this year and even showcased it in this year’s Paris Motor Show.